The Embroider Buddy® Blankey Buddies are made of very soft short plush fabric with a 2.5" contrasting border and an appliquéd heart on the left side. The face details are all embroidered. 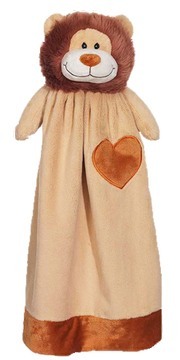 The animal heads and arms are stuffed with 100% polyester fiberfill. The blanket measures 20" long. They are machine washable and dryable.